(Makes 5 gallons) Barleywine - made from barley but can be aged like wine. 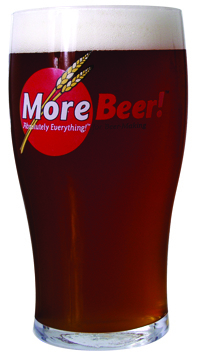 Our Barleywine has a beautiful copper color, voluptous body, and inviting smells of malt and hops. But don't let the good looks catch you off guard. This is a powerful beer with a bitter, yet balanced bite. Recipe includes 12 lbs of malt extract with Caravienne and Caramunich malts for steeping. Huge flavor with a good balance between malt and hops. This will age gracefully for years. Not for everyone, but those who like Barley Wines love this recipe.Estimated Original Gravity:1.078-82SRM (Color Range: 16IBU's: 82-86Estimated Alcohol Percentage: 7.8% Our recipe kits DO NOT include grain bags or yeast. The recommended yeast(s) can be found below. All grains will come milled.